President Trump has asked each cabinet secretary to propose a plan to cut 5 percent of their agency's budget for next year. Assuming this cut is relative to spending this year (we discuss other assumptions below), a 5 percent cut would be both reasonable and achievable. Such a cut would reverse only one-third of the spending increases over the past two years. Further, it would still represent a $63 billion increase relative to current law, which would need to be offset. It is relatively routine for Presidents to ask for such cuts; whether or not they actually propose them is a different story. While this proposal is not unreasonable, even if enacted these cuts would still leave discretionary spending significantly higher than when President Trump took office. In FY 2017, base discretionary spending totaled $1.07 trillion. The fiscally irresponsible Bipartisan Budget Act of 2018 (BBA 2018) and subsequent omnibus and minibus appropriations bills increased total discretionary levels by 16 percent over two years, to $1.24 trillion for FY 2019 (assuming remaining appropriations spend up to the caps). A 5 percent reduction from that level will still leave spending $112 billion and 10 percent above 2017 levels. For defense and non-defense discretionary spending, this would be 12 percent and 9 percent above 2017 levels, respectively. A 5 percent cut to discretionary budgets would still leave 2020 spending $63 billion above the current law sequester-level caps, which are about 10 percent below 2019 levels. 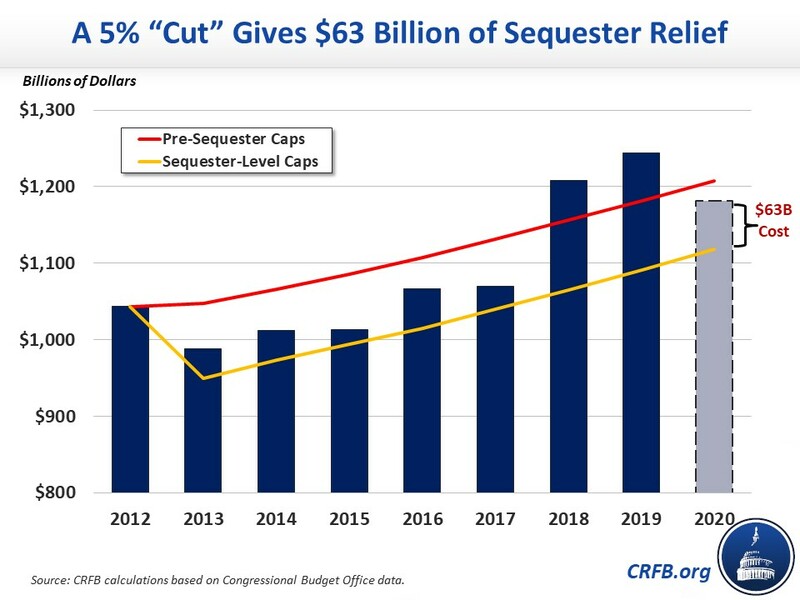 In fact, this 5 percent "cut" would offer relatively generous sequester relief – more than double the 2017 sequester relief. It also returns spending to a situation similar to the Bipartisan Budget Acts of 2013 and 2015 when lawmakers set caps above sequester levels but below the initial Budget Control Act (BCA) caps. Both of these bills were offset on paper with alternative spending cuts and revenue increases (albeit with some gimmicks), and any further sequester relief should be offset as well. The biggest problem with a 5 percent cut is not that it is too drastic but that it is too narrow and modest relative to the problem of widening deficits and growing debt. Discretionary spending itself makes up only 31 percent of the budget, with the rest being untouched mandatory spending and interest on the debt. Likewise, reducing discretionary spending by 5 percent would not reduce the size of fiscally irresponsible tax cuts enacted over the past year and would do little to reduce the recent spending hikes, let alone address the growth of entitlement program spending. Since this cut would still require increasing the current law spending caps, new mandatory spending cuts or revenue increases would be needed to prevent it from worsening the debt. Ideally, the $63 billion of savings would offset short-term costs and reduce long-term deficits. Trillion-dollar deficits could return as soon as this year, and debt is on course to reach the size of the economy within a decade or so. Current discretionary levels are far above sequester-level caps, 2017 levels, and even the original bipartisan BCA caps. Policymakers cannot continue to spend at these levels without real offsets elsewhere, and they should set more reasonable discretionary spending levels. In addition, policymakers must control our rapidly growing entitlement costs and increase revenue to fund the government we have. We interpreted the President's comments as suggesting a 5 percent reduction in discretionary spending relative to 2019 levels, which would mean a $63 billion increase relative to current law. However, the President's statement left room for ambiguity. If the President meant a 5 percent cut relative to the sequester-level 2020 caps (a 5 percent cut on top of the scheduled 10 percent cut), for example, the proposal would be deficit-reducing. In that case, spending would fall nearly 15 percent relative to 2019, and savings would total $56 billion. Press reports also mention the possibility that defense spending for 2020 will be set at $700 billion. If Overseas Contingency Operations spending is set to the President's request of $73 billion for 2020, an overall total of $700 billion would mean that defense spending subject to the cap would fall by $20 billion (3 percent) from 2019. 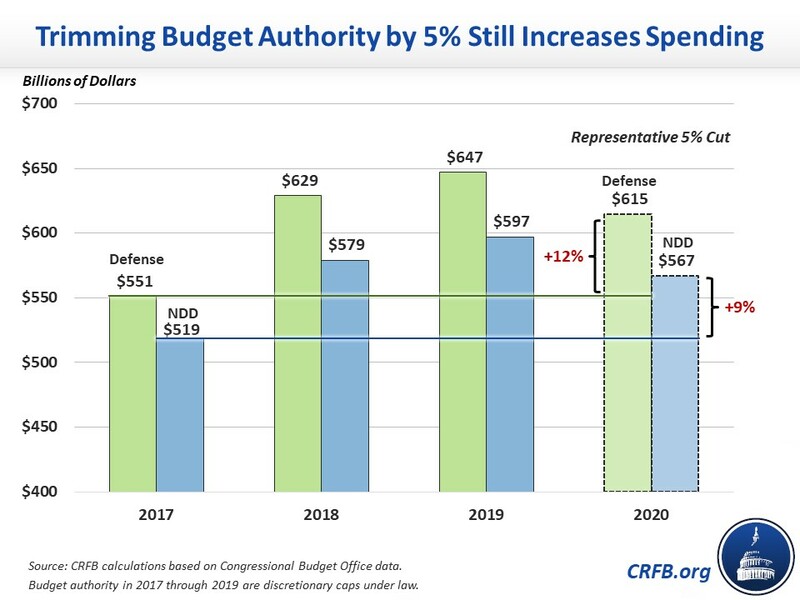 In that case, spending would increase by $76 billion assuming non-defense spending is cut 5 percent relative to last year and $24 billion assuming the non-defense cut is relative to current law. For context, complete sequester relief would cost about $90 billion, and continuing current spending levels would cost about $150 billion. Source: CRFB calculations based on Congressional Budget Office data. Totals may not add due to rounding.